Western attention has focused, briefly, today on the visit to Burma by US Secretary of State Hillary Clinton. Burma, formally called The Republic of the Union of Myanmar, is a large South Asia country of nearly 60 million people, governed by a military clique that has long been associated with a record of brutality, corruption and amassed wealth. A recent relaxing of oppressive rule, along with an election that brought in at least the appearance of civilian governance, the US' top diplomat calculated that the time was ripe to provide support for democratic forces in the country (and doing so in a non-confrontational manner). 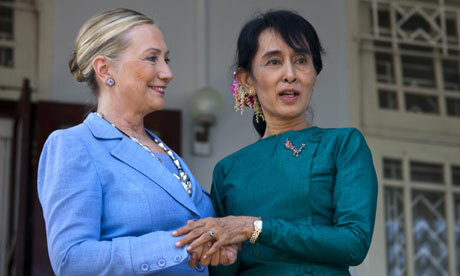 Secretary of State Clinton, and Burmese activist Aung San Suu Kyi in a high profile embrace, laden with unspoken support for Kyi's vision for Burma. As a bit of geopolitical background, we can read from a recent Foreign Policy Journal article, "Burma is a fascinating case study. It remains an authoritarian regime whose military tutelage is now disguised by a civilian veneer. Opposition leader Aung San Suu Kyi is free, but hundreds of political prisoners remain behind bars. The armed forces continue to make war and commit terrible human rights abuses against ethnic groups in the country's borderlands. Burma's rulers have no intention of ceding power to their political opponents -- but they do appear to be moderating at least the façade of their control over society through an incremental process of political reform. Why? One theory is that the generals fear undue dependence on China, which now exercises inordinate influence over parts of Burmese territory and significant sectors of its economy. Critics argue that Western sanctions pushed Burma into China's arms. The more accurate judgment may be that Western sanctions have worked, encouraging the Burmese regime to create some distance from China's embrace by releasing political prisoners, allowing the opposition to operate more freely, and meeting other Western demands so as to overcome obstacles to closer relations with countries other than China." For the past two decades, Burmese monks have often led resistance to the military rule - a loosening of confrontation has occurred in the past year. A fascinating scene showing the veneer of modernity in Burma's cities. Russia's own "back to the future"